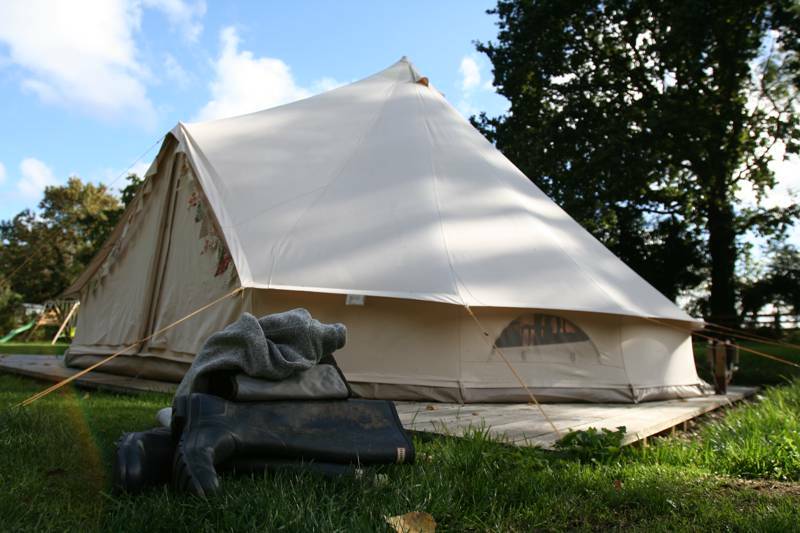 A six-metre bell tent, accommodates up to six guests. Cosy one bedroom brick and flint conversion. A perfect hideaway for couples or two people wishing to share a room. Lots of walks and cycle paths right on your doorstep and lots of woodland to explore. We can also arrange bike and canoe hire for the guests and fishing is available within 100 yards on the River Bure. If it weren’t for the detailed instructions, leading you down a narrow private road, across the River Bure and into the woodland beyond, you would never believe that Keepers Meadow even existed. While the grand Oxnead Hall – a 16th-century manor backed by pristine gardens – is unmissable from the road, the glampsite lies secluded amidst the trees. Such privacy is, of course, the appeal of Keepers Meadow. And with just three bell tents spread across the entire site, it’s clear the owners want to retain that peaceful and secluded ambience. A newly built shower block contains an individual shower room for each of the tents, finished to perfection with full-length mirror, complimentary soap, and wall-mounted hair dryer. You also get your own personal kitchen area, fully equipped with everything you need. The attention to detail really marks the place out; from BBQ utensils down to a cafetière, everything seems to be covered. The bell tents themselves vary in size. Two sleep up to four people, while the third, larger tent can sleep six. They include a double bed and bunks, with space to add an extra little one by squeezing in a travel cot. The décor is suitably quaint with bunting, scatter cushions and light, wooden furnishings – with plenty of space around them for kids to boot a ball around or fling a Frisbee. Anglers will be pleased to hear that, if you head back through the trees, it’s possible to fish for trout in the River Bure. The river here is split into two segments, after it was rerouted as a means to work four-storey Oxnead Mill, built in 1851. Even if you’re not coming to fish, it’s worth the stroll simply for the chance to look across at Oxnead Hall, a beautiful redbrick building with sections dating as far back as the 16th century. A stroll in the opposite direction, leads you to the Bure Valley Railway, with Buxton Station just ten minutes away on foot. Hop on a steam train and you can chug all the way into Wroxham, the heart of the Norfolk Broads. 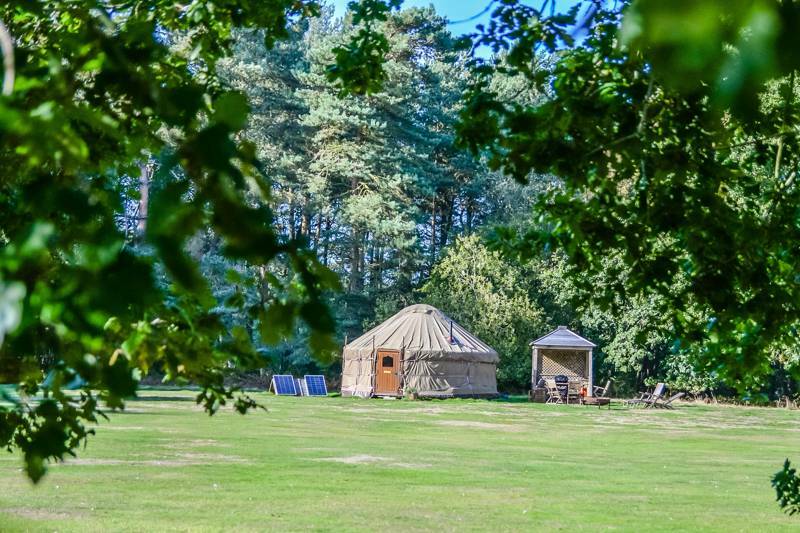 Just a stones throw from the banks of the River Bure you’ll find our Bell Tents fully equipped with the luxuries of a modern hotel room. Each has its own shower room, kitchenette and dining area for the sole use of its occupants, all under cover. Nestled beside its own piece of woodland and off the beaten track, our peaceful location is known to very few and couldn’t be better placed for a lovely selection of country walks, canoe trails and cycle routes. For latest availability and best prices for Keepers Meadow, please use the Date Search above. Glamping at its best !! Another great holiday at Keeper’s Meadow! We booked the whole site again - how lovely having all the family together to share the fun! We really love this site, the facilities are amazing and the hosts Gary, Michelle and Ethan are superb - nothing is too much trouble. They rescued us 3 times in the first afternoon! Getting lost, forgotten milk etc! We have already booked for next year - think it will now become an annual holiday! 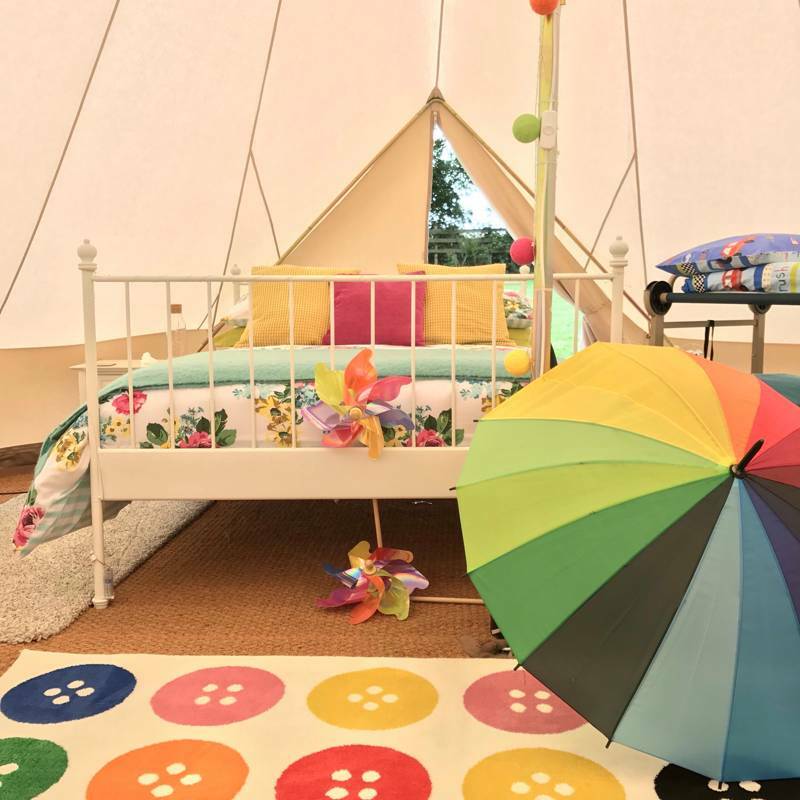 Beautiful tents again this year, the children loved their specially selected bed linen - Michelle thinks of everything. Fab shower rooms and so warm in the cooler early mornings. We had a really great time canoeing down the river on saturday afternoon - we all loved it! Our two 3 years olds sat still for 2 hours enjoying the trip. Barbecue around the campfire in the evening followed by a glass of wine and toasted marshmallows! So relaxing! Very disappointed children when we had to leave! Can’t thank our hosts enough for their amazing glamping site and fantastic hosting! Roll on next year!! Fantastic stay at Keepers Meadow, fab setting, excellent facilities - what's not to love! We had a fabulous stay at Keepers Meadow. From the minute we got the unexpected welcome pack in the post I knew it would be a different stay to any of our other glamping experiences. The welcome pack was so useful in helping me pack, which meant we literally packed our clothes, some of the kids buckets and spades and the all important bikes and we were off! As soon as we arrived on site, the kids scattered to the play area they could see as we pulled into the car park, and they pretty much spent the rest of the week there with the other children on site when we were around in the mornings and evenings. Michelle greeted us warmly and showed us round the tent and all the facilities. She also helped us source a bike to hire with a child seat, which was going above and beyond hostess and site manager role in my opinion. The tent was very exciting for us all, I was particularly excited about having a proper bed for the week (as opposed to an air bed in a pod! ), the children loved the bunk-beds and I thought it was so thoughtful of Michelle to pick bedding for the children which matched their ages and gender. The fairy lights created a cosy ambience and on the day that rained, we made use of the stove making it even more homely. The kitchenette was fab, everything you could need and more. The bathroom was great and we all loved that it was a proper shower and cubicle. Everything was so clean and nothing was too much trouble - like bringing a fire pit over (which we didn't use in the end). All round - a wonderful week at Keepers Meadow, great location for visiting the area - Cromer is lovely and we had some super lobster tails. Bewilderwood was fantastic for the children - they loved the slides, zips and tree tops adventures. Great day on the steam train to escape the rain. Even if you don't want to visit further-a-field the surrounding countryside and woodland means there's enough to keep you occupied through the day. We loved it all so much we are already booking for next year! An amazing glamping trip - thoroughly enjoyed by all. The hosts have literally thought of everything. Real home from home comforts - beautifully done. Loved getting the canoe on the river for early morning paddles. Peaceful location. Stayed for 4 nights from 30th July 2018. Such a beautiful site, in the middle of fields and woods, lovely walks all around. 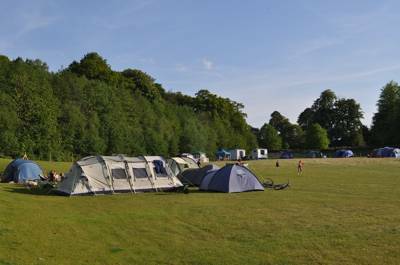 The tents, toilet and shower room and kitchen was immaculate and really well equipped. The owners were really helpful and friendly. The children had a magical time and we will be back! 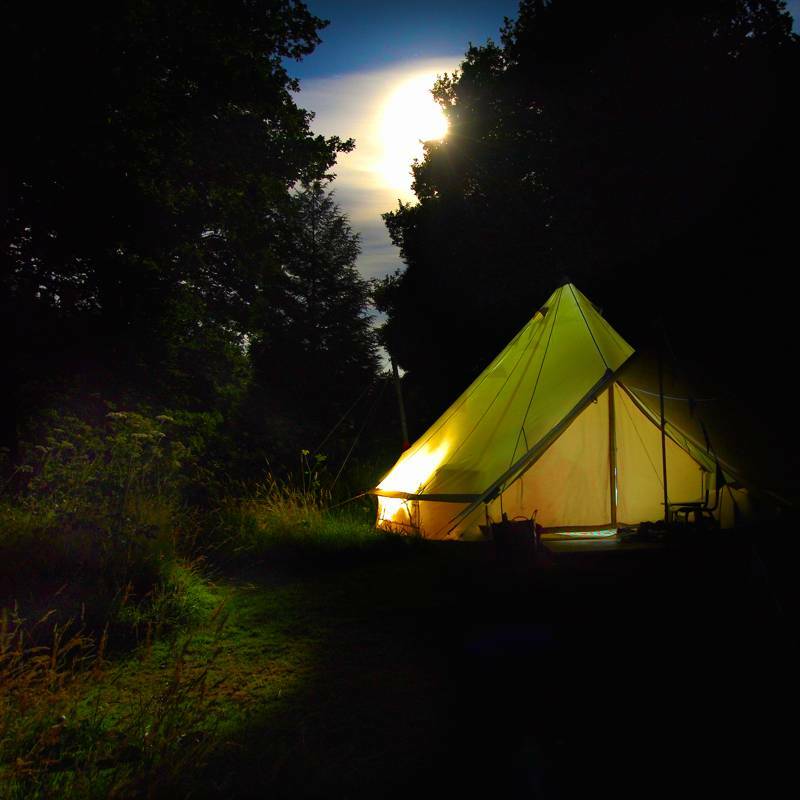 10 of us stayed from Friday 15th - Sunday 17th June 2018 Set within quiet beautiful surroundings are the 3 immaculately presented bell tents each with their own ensuit and kitchen facilities. The cleanliness of the site is second to none, cutlery, plates, pans, bed linin etc.. are of the highest order. 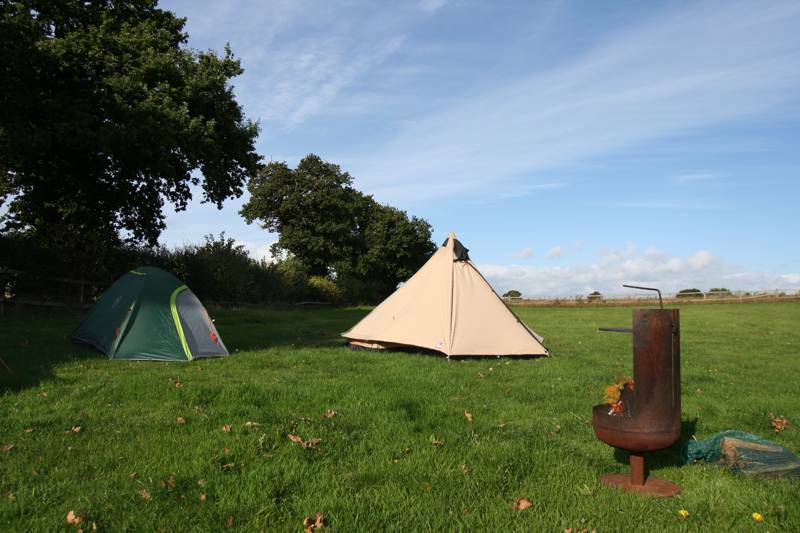 Each Bell tent has a wood burning stove fully supplied with all the fuel you need to keep it going. The lights and decor within the tents put a touch of class that sets it above the competition. The owners Gary and Michelle are so lovely and attentive, we owe them a debt of graditude for all their hard work in making the weekend so special. Book this accommodation I promise you won’t regret it. As a non camper....I have to say I’m a convert. Well a convert to Glamping at Keepers Meadow. Amazing location, amazing facilities (comprehensive and extremely clean) and the owners could do enough to make our stay memorable, including the mystical flames for our fire pit, you have to try it. In summary a faultless stay, a total gem for the tourism industry in Norfolk. Keep up the amazing work Gary, Michelle and family. We all hope to be back soon. Amazing weekend! Already booked to return! We have just returned from a great weekend at Keeper’s Meadow. As a family, we booked the whole campsite. 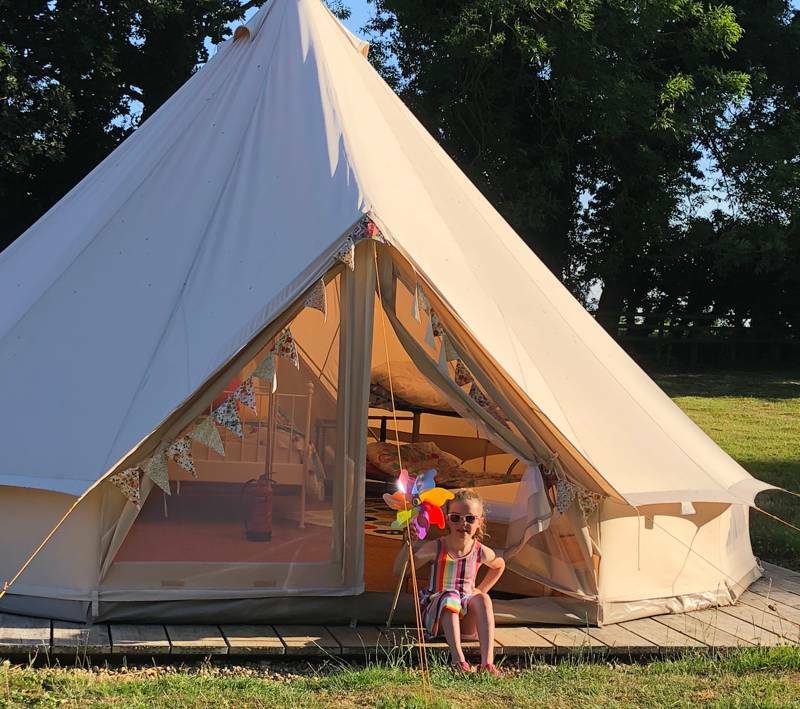 We had 3 lovely tents decorated to a very high standard – it was especially lovely that our thoughtful host Michelle had tailored the children’s bed linen to suit their ages. Our two toddlers were so excited to sleep in their butterfly and dinosaur beds. Each tent has its own superb shower/toilet room and kitchenette area, all so well stocked that we didn’t want for anything. The daytimes were so enjoyable knowing that the children were safe, with the campsite being fenced on all sides. They had so much space to run around and play, with adjoining woods to explore. Our children very much enjoyed a journey on the nearby steam train, only a short walk away, which can take you to several lovely surrounding locations. An excellent indoor play area just 12 minutes away for our one rainy afternoon. We didn’t need to do any other site seeing as we were more than happy just enjoying Keeper’s Meadow! We spent lovely evenings around the campfire, enjoying the barbeque and then toasting marshmallows under the beautiful evening sky. Our hosts Gary and Michelle were so friendly and always happy to help, providing us with 2 items which we had forgotten to take. Nothing was too much trouble. A wonderful glamping experience and great to spend quality time together as a family. We have already booked the whole site again for next year and can’t wait to go back! I stayed here for three nights in early July with my parents and five year old son. From the initial booking to our departure from the tent, the service we received was second to none! The owner Michelle, ensured we received details of everything we would need to know from getting to the site to cooking equipment and local areas of interest before our arrival. Upon our arrival at Keepers Meadow, we were greeted by Michelle and shown to our tent. I use the word tent in the loosest sense as it was more like a boutique hotel room! Sensational is the word I would use to describe it - from the beautiful double bed, cosy bunk bed and twinkly fairy lights to the welcome log burning fire (gorgeous at night to keep you toasty warm) and little touches such as cosy rugs and umbrellas. The kitchen is in a quant summerhouse/she'd decorated with fairy lights with a large gazebo to eat under. Each tent had its own kitchen, equipped with everything you need to cook plus a BBQ and fire pit, which you can hire for the duration of your stay for a small amount. Our hosts, Michelle and Gary, met our every need and were exceptional. 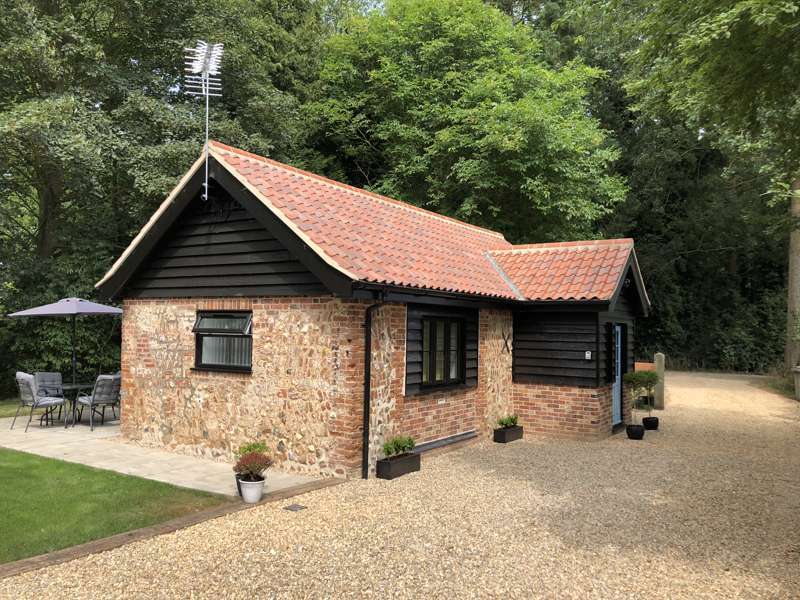 The location is perfect - remote enough to feel peaceful but within ten minutes walking distance to the nearest village for provisions, not to mention the lovely Bure Valley Railway. We loved our stay at Keepers Meadow and will definitely be back. The only change we will make is to stay for much longer! A truly magical glamping experience! Stayed at Keepers Meadow last summer, 5 adults and 4 children in 2 tents. We had a fantastic time, everything was fresh, clean and tidy. Lots of thoughtful little touches like tea, coffee etc, well equipped kitchen, picnic table for each tent plus child sized one and loads more. Setting was idyllic, right next to the river and not far from the steam train. If you picture glamping in your mind, Keepers Meadow is it. Will definitely stay again. Keepers Meadow is such a wonderful place for a family holiday. The site far exceeded our expectations. It is immaculate and felt like we were the first family to use the facilities. Lots of thought and planning has gone into making sure that everything is there that could possibly be needed. Our hosts for the week were very welcoming. 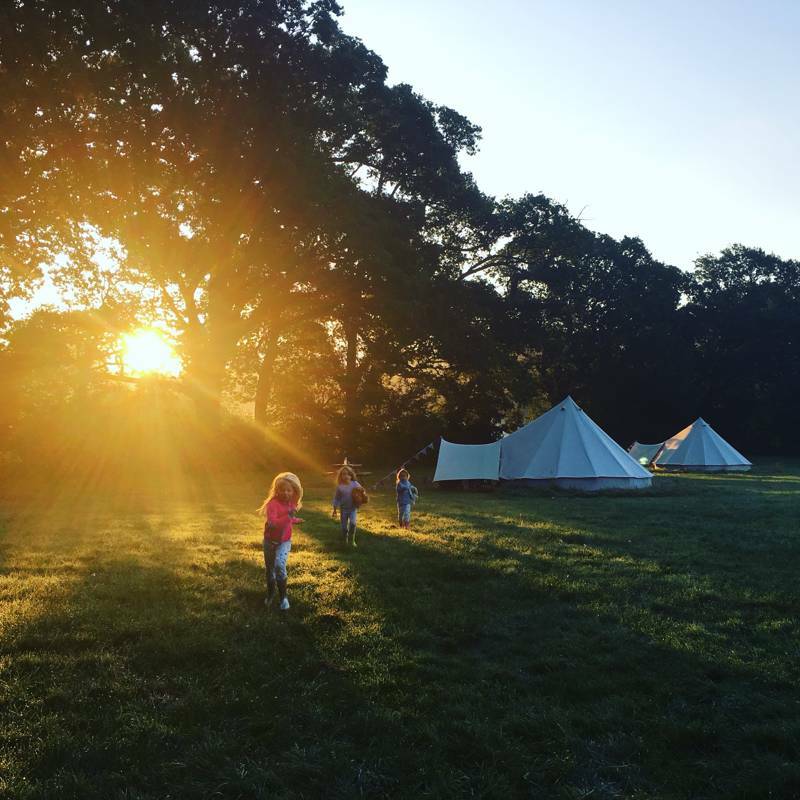 When the children approached them they spent time answering lots of questions and sharing their excitement at their first glamping experience. The surroundings are beautiful, we enjoyed lots of local tourist activities but without a doubt the children's favourite experience was collecting their own wood for their fire pit, and climbing trees in the surrounding woods. Lazy evenings were spent playing with the children of our neighbouring families, making memories that will last a life time. Keepers Meadow offered our children the type of holiday we hoped for. They were close to nature and carefree! Thank you to our hosts, and the other families we shared the site with. 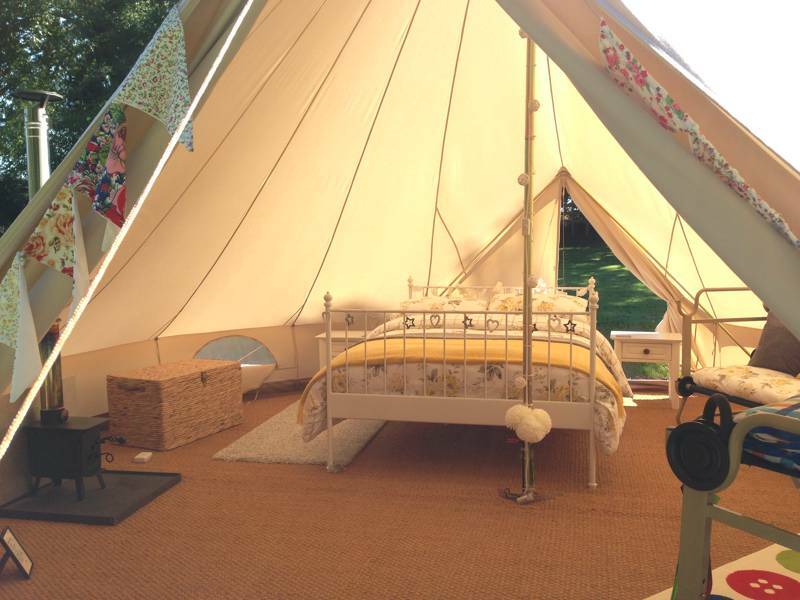 3 pre-pitched, furnished bell tents. Glamping only. Groups – yes. Dogs – no. 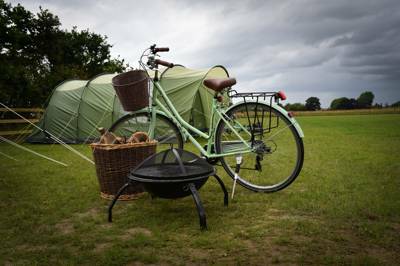 Bell tents come furnished with beds, bedding, and wood for the woodburner provided. Mains lighting and sockets in tents as well as a selection of fairy lights. Each has its own fully equipped kitchenette, including fridge (with ice box), twin electric hob, cooking equipment, utensils, crockery, cutlery, kettle, toaster and a private shower room. There's also a wood-burning stove, a BBQ and a firepit for your own campfire. There's a communal washing up area, where you'll also find a microwave. Canoe hire, cycle hire and day passes for trout fishing in the river are all available. Camping chairs provided and picnic table under cover of a gazebo. Private woods to explore and deer to find. Ten minutes' drive away, you'll find Stompers (01692 407793), North Norfolk's largest indoor play experience (also featuring ten-pin bowling). The county capital, Norwich is half an hour away by car. The compact centre makes it a wonderfully walkable city with plenty of top attractions in which to take shelter, including the cathedral (01603 218300), Arts Centre (01603 660352) and Norwich Castle Museum and Art Gallery (01603 493625). There's also four cinemas in the city and. closer to the site, a swimming pool in North Walsham (12 mins drive away). Canoes can be hired and delivered to the site to dabble on the River Bure. Or why not take off on one of the local footpaths through the surrounding countryside. 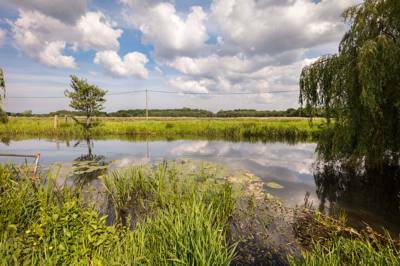 It's a 10-minute walk to Buxton Station (01263 733858) – hop aboard a steam train on the Bure Valley Railway and whistle south into the Norfolk Broads. 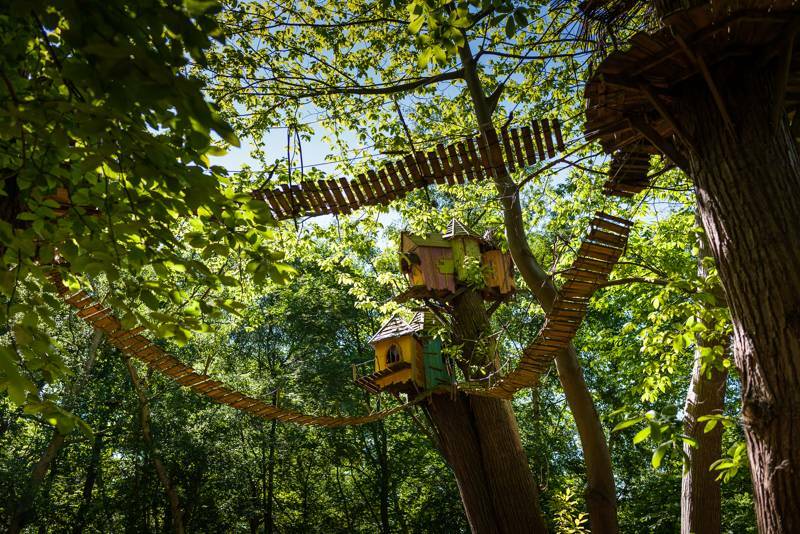 Just outside the pretty village of Horning, Bewilderwood (01692 633033) is a particularly popular family attraction. Based on the series of books by local author Tom Blofeld, it brings the watery environment of the Broads to life – both as a land of make-believe and an overgrown adventure playground full of rope bridges, ladders, zip wires and tree houses. For more 'grown up' Norfolk culture, try a visit to Blickling Hall (01263 738030), probably the finest Jacobean mansion in Norfolk. With craft shops, beauty salons, eateries, mini golf, a petting zoo and fun fair (throughout August), Wroxham Barns (01603 783762) has plenty to offer for both young and old alike. For a day at the seaside Great Yarmouth (about 35 mins away) Cromer (25 mins) are your best bet – the latter is home to a sandy beach and a charming old pier. , each a within a 10-minute drive. The Crown (01263 733534) at Banningham is another excellent local (5 miles away). For fish and chips, the Buxton Fried Fish and Chip Shop (01603 278256) takes some beating. The nearest train station is in Worstead (0845 748 4950).